I thought maybe this would be a book that showed the dangers of trying to change who you are to make someone like you. I just didn't think that it would show someone trying to kill you because you'd changed! Oh, and the cheap shot at the French was just the icing on the cake. I know it's an American pastime to throw shade in their direction, but come on. This is a middle-grade book. Should we really be encouraging our kids to make fun of other cultures? Fake Blood is cute and kinda fun, but it is also terrifically dull and tediously overlong. Exceptional art can sometimes make up for these issues...and that's not the case here with Whitney Gardner's simple, colorful illustrations. I know I'm not the target market for a graphic novel featuring sixth graders, but I think even sixth graders would be bored here. Here's the plot, such as it is: AJ likes books and Nia, Nia likes vampires, AJ decides to dress up like a vampire to get Nia to like him. T Fake Blood is cute and kinda fun, but it is also terrifically dull and tediously overlong. Exceptional art can sometimes make up for these issues...and that's not the case here with Whitney Gardner's simple, colorful illustrations. I know I'm not the target market for a graphic novel featuring sixth graders, but I think even sixth graders would be bored here. Here's the plot, such as it is: AJ likes books and Nia, Nia likes vampires, AJ decides to dress up like a vampire to get Nia to like him. Totally logical. AJ has some rambunctious friends and a smartaleck sister. The "dress-up-like-a-vampire" plan goes awry, but in an unpredictably weird way. Then more vampire-related weirdness happens. I guess I'm trying not to give away spoilers, but trust me: the reveals are not exciting. Super fun! Definitely a blast for vampire fans. I love that it was set in Portland and there were lots of fun references to the city. 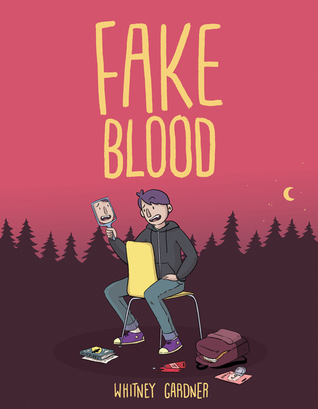 Ok, this was a seriously cute and fun graphic novel about a boy who pretends to be a vampire to attract the girl he likes (a girl who is obsessed with vampires). A nice mash-up of the coming of age story with a clear send up of the Twilight series. Perfectly-situated for that entering middle school reader navigating the changes that come with getting older and the transitions that come along with growth. Real cute! Liked the art and colors, enjoyed the story. Queer inclusion woulda been nice. This is great! I giggled so hard at this graphic novel. The story is just too funny! Kids are going to love it.